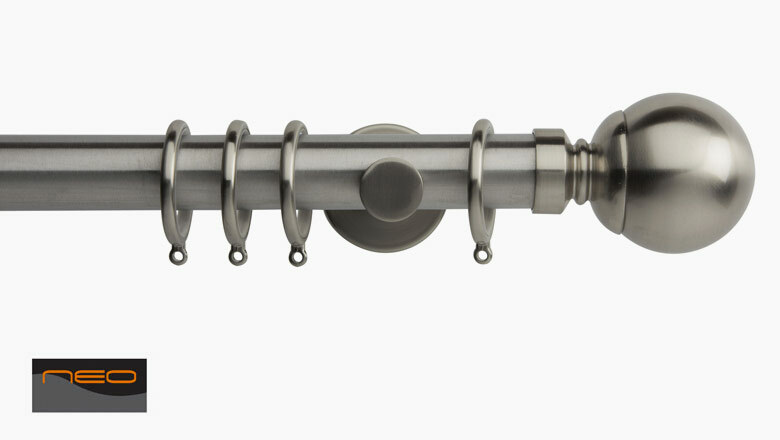 We have categorised extra long curtain poles for wide windows and bi-fold doors as being over 360cm long. 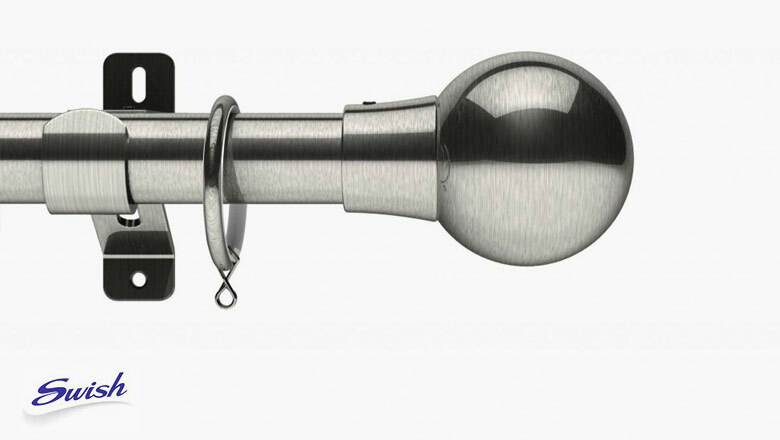 Most of our curtain pole ranges are available up to 360cm, so please see our metal curtain pole and wooden curtain pole pages if you don’t have a requirement over this length. If you require an extra long curtain pole over 360cm please see a summary below of our brands that may offer products suitable for your requirements. The Swish Design Studio (available in a 28mm and 35mm diameter) range offers a wide choice of contemporary finials creating interest at your window. The poles sets are available with or without rings, and with wall or ceiling fix brackets. 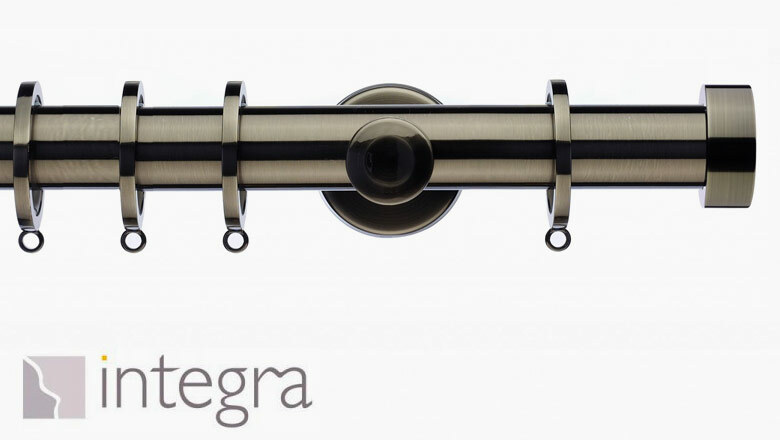 The Integra Inspired range (available in a 19mm which is only up to a 360cm length, 28mm, 35mm and 45mm diameter – all available up to a 480cm length) offers a range of beautifully designed finials. A high gloss white and black pole in available in their 28mm range, which is available with a ball or stud finial style. 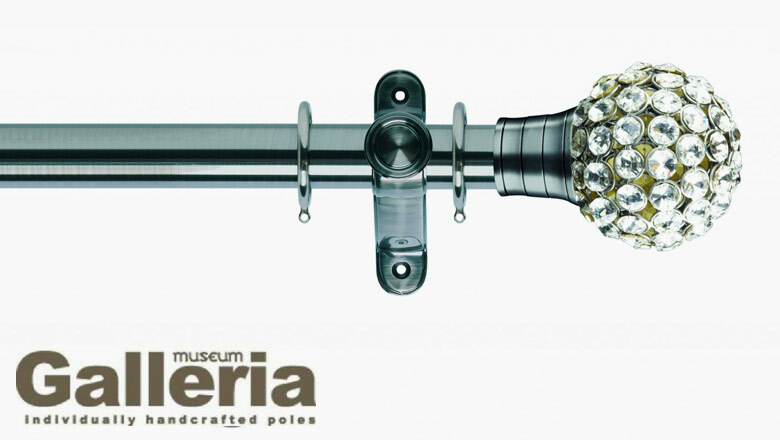 The Rolls Galleria 35mm and 50mm curtain pole ranges are stunning, sophisticated and stylish. Both diameters are suitable for heavyweight curtains and go up to a 480cm length so are suitable for extra wide windows and bi-fold doors. The solid die cast brackets are of the highest quality. The finials in the Galleria range are truly stunning and really create the wow factor at your window. The 50mm poles are ideal for large rooms, tall ceilings and heavy fabrics to finish off a room perfectly. We offer a free cut to size service on the Galleria range. The Jones Lunar (28mm), Jones Strand (35mm) and Rolls Neo (19mm only available up to 480cm, 28mm & 35mm – both available up to 6m) ranges of curtain poles are a very popular choice for extra wide windows and bi-fold doors. The added value components in these ranges are a real step up from the high street / DIY specification of components. These brands offer a range of bracket choices with longer bracket extensions. They are ideal for eyelet curtains as they enable the curtain to sit a little bit further away from the wall, so the curtain doesn’t rub on the wall. There is a wide choice of finials available to complement the extra long curtain poles with faceted glass finials available in the Neo premium range and glass and mosaic styles available in the Neo Style range. 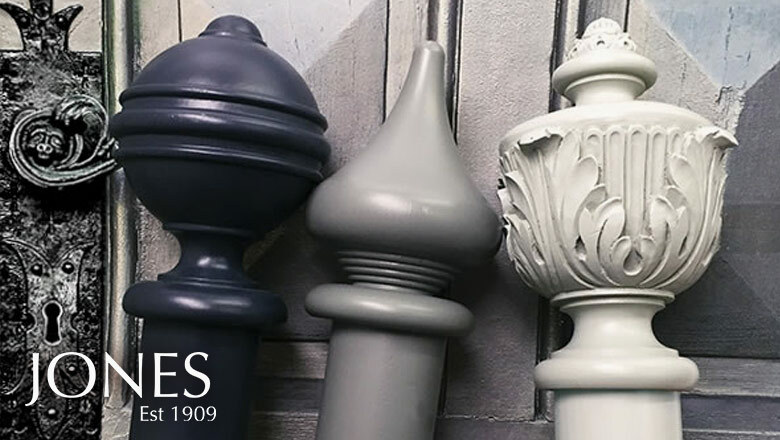 The Jones Strand range of painted ball finials are stunning and capture current interior design colour trends. There are also oak finials available which complement oak doors or other oak furnishings beautifully. The double poles in the Neo range are also available up to a 480cm width. If you only have one curtain that you wish to draw from one side of your window over to the other side the Swish Design Studio, Jones Lunar, Jones Strand and Rolls Neo offer a passing bracket and passing rings making this possible. Please get in touch with us if you have this requirement and we can ensure your pole is supplied with the correct amount of passover brackets and passover rings. Please email your requirements to: sales@thehomeofinteriors.co.uk or call us on 01625 449039. If you have a wide window and particularly heavy curtains please look at our Jones Strand and Neo 35mm ranges. We have put a 600cm heavyweight option on these poles, which means the poles will come with 2 passover brackets that will be positioned in the middle of each of the 300cm poles to offer extra support. We will also supply the poles with enough Passover rings to ensure your curtain passes over the middle supporting brackets. Please note the Passover brackets are not suitable for eyelet curtains. 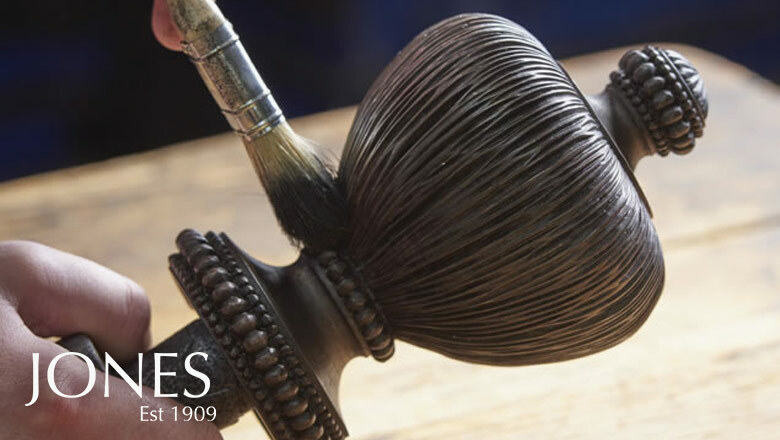 Jones Interiors offer a wide range of hand crafted curtain poles that are hand finished to create a beautiful curtain pole. All of their poles are available up to 300cm as a single piece. You can join 2 poles together with a double-ended screw giving you a maximum width of 6m. 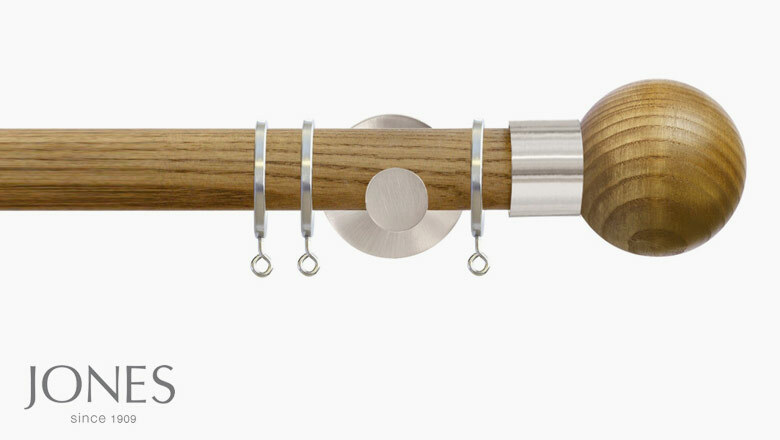 Jones have curtain pole collections ranging from their 30mm Cathedral range up to their 63mm Grande range. The colours in the 30mm Jones Cathedral range are layered and contrasted by hand to give a rich, aged appearance. They have 2 ranges available in a 40mm diameter; the Jones Hardwick range offers colours that work in both traditional and contemporary homes, with a choice of 4 different finial styles; and the Jones Seychelles range offers pastel shades in a matt finish paint that captures current interior design trends. These complement the blush, grey, blue hues & coastal trends beautifully. Their 50mm Florentine range encompasses style and elegance using traditional finishes applied by their skilled craftsmen. The acanthus finial is the best seller in this range, and acanthus style brackets and holdbacks are also available to add attention to detail and the finishing touch to your window treatment. 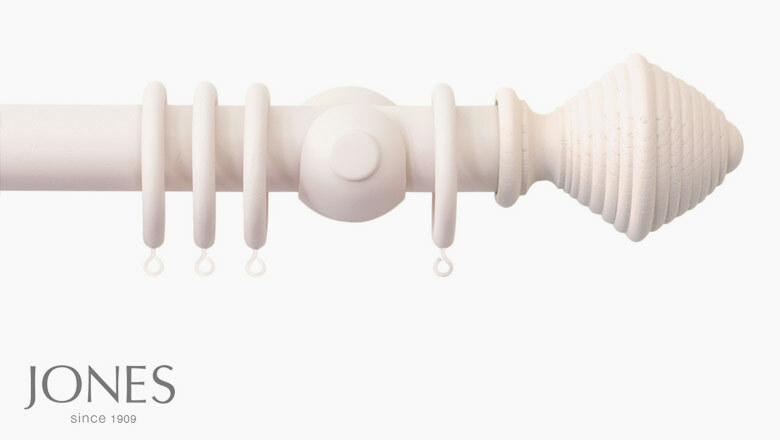 Building on Jones’ expertise and knowledge their Estate range of 50mm wooden curtain poles mirrors the most popular interior décor colours en trend now. 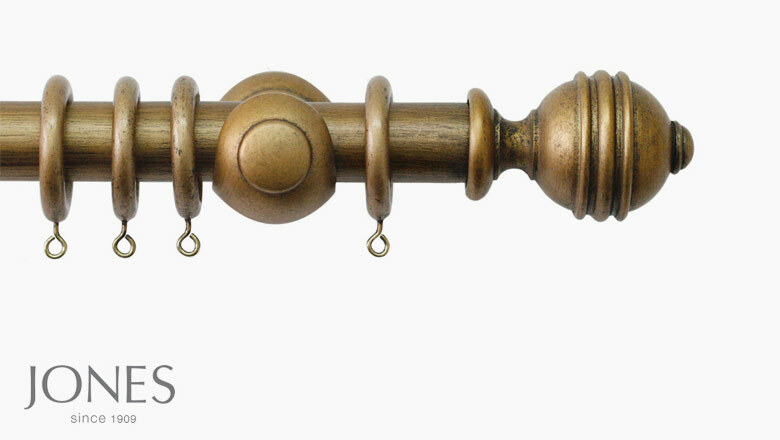 12 different colours are available with a choice of 4 different finial styles. Finally their 50mm Oakham solid ash collection is stained by hand, which encourages the grain of the wood to become visible. There is a choice of 8 different colours available with either a ball or cone shaped finial. Looking to make a statement! 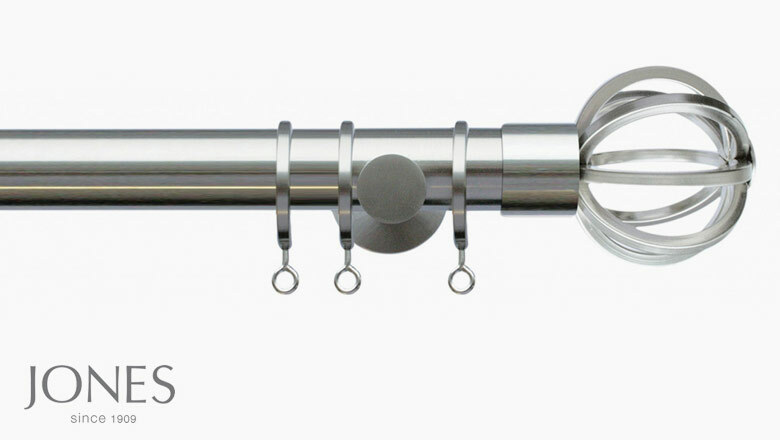 If you are looking to make a real statement at your window and create the ultimate ‘wow’ factor the Jones Estate 63mm curtain pole range is worth consideration. Grand designs in grand colours finished by skilled craftsmen makes this a popular choice for a statement look. 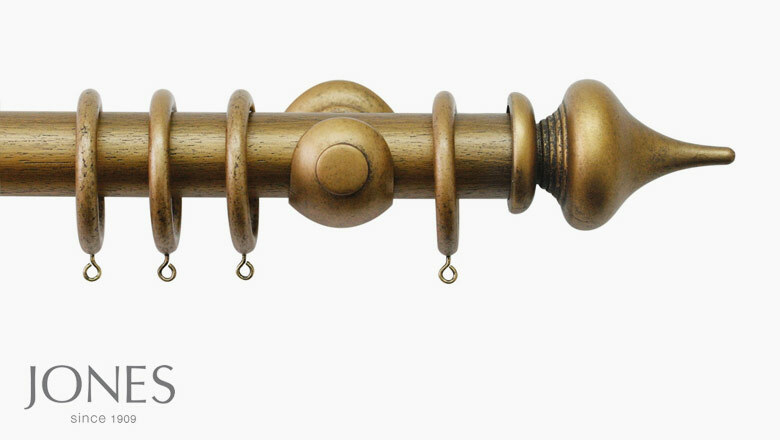 Jones Interiors can supply any of their handcrafted wooden curtain poles to a colour of your choice! Simply select a paint colour of your choice and their craftsmen will create a bespoke curtain pole just for you available up to a 6m width. Please specify your paint details, with the correct colour reference, in the notes section at the checkout. Please note the £42 paint service charge is for a pole set at any length which includes the finials, brackets, poles + rings. Don’t forget to purchase your pole as well as adding the Bespoke Paint Service to your basket!